Last week, my phone died. This was unexpected because my phone was less than a year old. 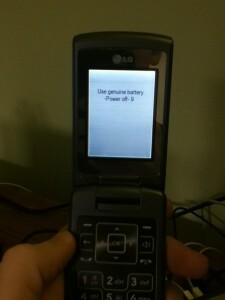 That said, the phone would heat up incredibly for no reason during its last days. Maybe it was time. I think the phone might have gone and committed suicide in protest because it saw me looking at plans for iPhones, and it got jealous. 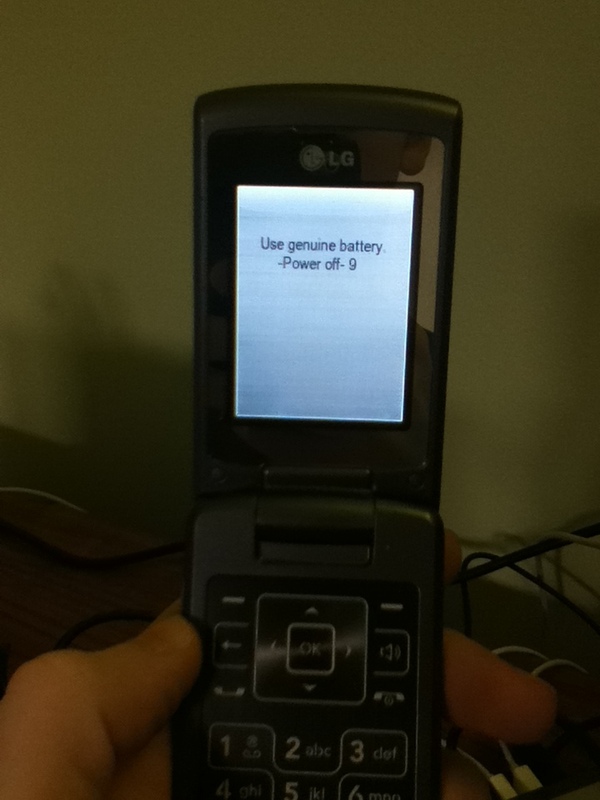 Attached is a photograph of the only thing that my old phone does now. The battery is the same battery as I’ve always used, but now the phone will only tell me to use a “genuine battery,” and then it starts counting down from 10. It gets stuck around 3, and if you wait a really long time it eventually shuts off. I lost all the phone numbers that were in it, but I think I had most of them in my address book on my computer anyway. On the upside, I was thinking about getting an iPhone anyway, to help with developing an iPhone app that I’ve had in mind for a while. Also, this means that I can have a custom ringtone, and of course, I converted an mp3 I’ve had sitting on my computer for years to make the “Mosquito” ringtone. It’s ten seconds of shrill goodness that many adults can’t hear. You can download my new ringtone here, formatted for the iPhone. Just drag it into your iTunes.